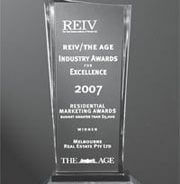 Baracon’s lead selling agent Melbourne Real Estate (MRE) has pulled off the REIV top marketing award 2 years in a row for Baracon’s 2 most recently completed projects. The prestigious awards presented by the REIV and sponsored by The Age are testament to the marketing approach undertaken on both projects. Baracon’s Brett Rogers worked closely with MRE’s Peter Hooymans to ensure both projects marketing collateral was exceptional and that the selling strategies would reap reward. The first award was for Baracon’s Oasis, Mission Beach a 140 lot land subdivision in far North Queensland which won the REIV’s top category marketing award. Marketing this project proved a challenge with local agents struggling to get it off the ground. MRE was appointed by Baracon and held a gala launch party selling 33 blocks on the night. This momentum eventually resulted in 100 sales in 180 days. The second award a year later for Charlie, a 96 apartment 8 townhouse developed by Baracon in Richmond had a different strategy again winning the REIV’s top category marketing award. MRE was awarded the lead agency role for the Charlie Richmond project. To create sales momentum prior to contracts being available, we ran with an Expression of Interest Campaign which immediately generated strong interest from our client data base, Hooymans said.The international campaign was planned to run in conjunction with the Cityscape exhibition in Dubai – the world’s largest Real Estate exhibition. This gave us the opportunity to introduce our product to a wider group and build on our existing international clientele. The end result was 75 sales. The awards are reflective of Baracon’s and MRE’s continued success in both project marketing and delivery.